Rugged waterproof compact cameras tend to be fashioned to look as hardwearing as they claim to be, with chiselled edges, intricate details and exposed screw tops all giving the impression of solidity. Ricoh's PX proves this doesn't always have to be so; it eschews it all and instead opts for a clean and minimal design. 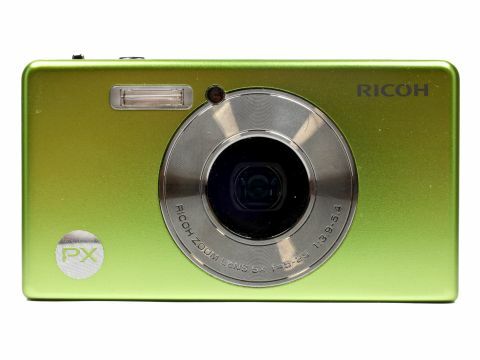 While the company's previous waterproof digital cameras were aimed at industrial rather than consumer use, the Ricoh PX combines its more conventional styling with a set of specifications comparable to those from other rugged models. The camera incorporates a 16MP CCD sensor, one fitted with a stabilisation system to help keep images blur-free, along with a Smooth Imaging IV engine for all image-processing tasks. Optically the Ricoh PX spans a reasonable 5x optical zoom range of 28-140mm, but Ricoh confidently claims that this can be doubled "with almost no drop in image quality" – a claim that'll be investigated later on. Regarding its rugged credentials, the PX is waterproof to a depth of 3m and dustproof to the Class 6 JIS/IEC specification. It may also be safely dropped from a height of 1.5m, although Ricoh points out that some scratches and cosmetic damage may result from doing so. Scratch resistance has, however, been incorporated into the camera's LCD screen, which measures 2.7 inches in size and offers a fairly basic 230,000dot resolution. The rest of the camera's specifications are in line with what we'd expect for a sub-£200 model. A 256-segment metering system provides the multi, centre-weighted and spot trio of options, while exposure compensation may be regulated over a range of +/-2EV. A capable sensitivity range of ISO 100-3200 also features, as do a variety of focusing options such as multi-area, spot and AF tracking. A handful of Ricoh's trademark extras can be found among its feature set, such as the Skew Correction mode to correct sloping verticals, and a multi-pattern auto white balance option which varies white balance for different areas of an image. There are also a number of novelty capture options, such as High-Contrast Black and White, Miniature and the slightly odd Sweets mode, which does little more than provide a white frame for those times when you want to photograph sweets. Movie recording is also possible on the Ricoh PX to 720p resolution, and a micro HDMI port is found alongside a mini USB one. Helpfully, it's also possible to charge the camera through a USB cable connected to either the supplied adaptor or a computer, while all images and videos are recorded to the user's choice of SD, SDHC and Eye-Fi media, or to the 40MB of internal memory.